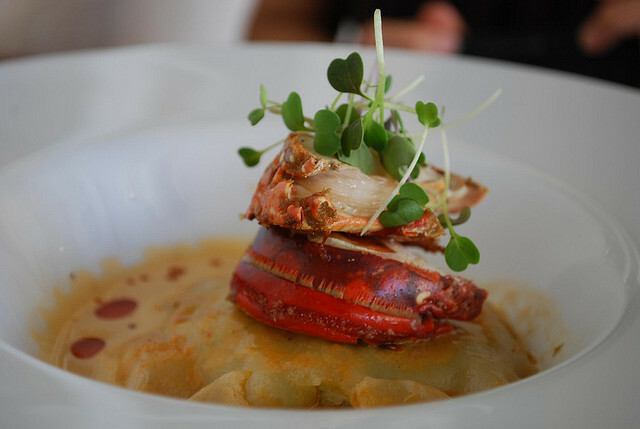 The key to the lobster vacation is the combination of shellfish and setting. Like lobster and melted butter, tasty fresh seafood plus the beautiful waterside views of a classic lobster shack are beautiful together. If you’re eager to travel to find the best lobster in New England, then the atmosphere and the location are just as important as the delicious sunset-red lobsters themselves. Here’s a list of five of the best lobster restaurants in New England – each one is worthy of a dedicated trip. Thurston’s, located practically within Acadia National Park, is number one on the lobster list because the view, the atmosphere, the taste, and most of all: the all-important ocean-to-table factor. Ocean-to-table factor is determined by a few semi-measureable characteristics: Distance from lobster boat to restaurant, quality of the view of the lobster boat unloading, and speed from boat to cooker. At Thurston’s you see the boat unload on the dock in the picturesque Bass Harbor, drool as you watch the lobsters carried from boat to restaurant, and bask in the smells of the outdoor cooker firing away with each fresh catch. All these sights, smells and tastes are enjoyed on a large two story screened-in deck hanging over the water. Arguing over which seafood shack in New England serves the best lobster roll is like arguing with New Englanders over whether the Red Sox, Bruins, Celtics, or Patriots are the better team. There is no right answer, they’re each different and great in their own way, and the arguing is just getting in the way of eating more lobster. The Clam Shack in Kennebunkport provides everything you could possibly want from a classic Maine seafood shack, with an impressive ocean-to-table factor, perfected simplicity, and ARGUABLY the best lobster roll in the entire region. Plus, Kennebunkport is one of the most beautiful towns in the state of Maine. The Clam Shack is posted right on the bridge over the Kennebunk River that leads out to the ocean through a quintessential Maine coast inlet. Simply put, I fell madly in love with the lobster roll I inhaled here, and the secret is the fresh, locally baked bun. Yes, their fried clams are awesome too. Located on a dock overlooking the harbor in Noank, Connecticut, Abbot’s focuses heavily on the actual process of cooking the lobster. They use the low-steaming method in huge cast-iron vaults, sealing in the lobster’s natural taste. Lots of lobster rolls are actually lobster salad, mixed with mayonnaise and stuffed into a sandwich. At Abbot’s, the lobster does all the work, with a huge pile of fresh, flavor-maxed lobster stuck in a hot, buttery roll in classic Connecticut style. For added atmosphere points, striped bass in the harbor feed on chowder crackers below the dock. Located on some of the deepest, coldest water on the Maine coast, Sheepscot Bay is the ideal location for catching delicious cold water, hard shell lobster. Five Islands is a bare-bones lobster joint, relying on the flawless natural flavor of the fresh-caught lobster and the perfect setting to deliver lobster nirvana. You’ll find Five Islands on a pier at the end of a country road, like a tiny weather-worn shingled beacon of lobster prowess. There’s open seating right on the dock, and don’t’ be surprised to encounter locals who actually eat here, a true testament to the quality of Five Islands Lobster Company. One of the best ways to enjoy fresh lobster is at a clambake, which typically includes Maine lobster, steamers, and clam chowder. At Fosters, you get the classic large Maine clambake restaurant feel as you walk by pools of lobster, place your order at the counter, and enjoy the picnic-style eating area. Fosters delivers amazement through the inherent draw of the quick order, quick serve lobster clambake, and does entice a fair number of tourists. The energy of the place smoothly builds off the newbies and the experts, dining side-by-side with the sounds of live music, boiling pots, and laughing kids setting the tone. If you’re looking for a family spot, this is it. And don’t forget to snag some goodies at the gift shop to prove you did the Maine Lobster vacation right. Sailing along the Maine coast on one of the 13 vessels in the fleet of the Maine Windjammer Association is the highlight of any trip to Maine, but when you throw in a lobster evening with your ocean voyage, it’s unforgettable. Cooked right in front of you during your trip on the ship, it’s hard to beat fresh caught lobster enjoyed on a sailing cruise along the rocky coast of Maine.